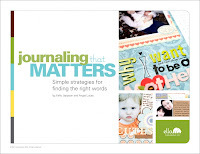 Journaling That Matters is the newest eBook to join the virtual shelves of Ella Publishing Co. and it delves into a topic near and dear to my heart. As someone who majored in English in college, journaling has also been a major part of my scrapbooking. Not that I include extensive journaling on every layout (I don't), but I do certainly recognize the importance of WORDS in this wonderful hobby. However, journaling is a struggle for many. Even I get stumped or find myself at a loss for words from time to time, so I always enjoy ideas to help me explore topics that I might not have otherwise explored or simply help me to give a bit a a fresh twist on a topic to keep the words from falling flat. Journaling That Matters does just that. 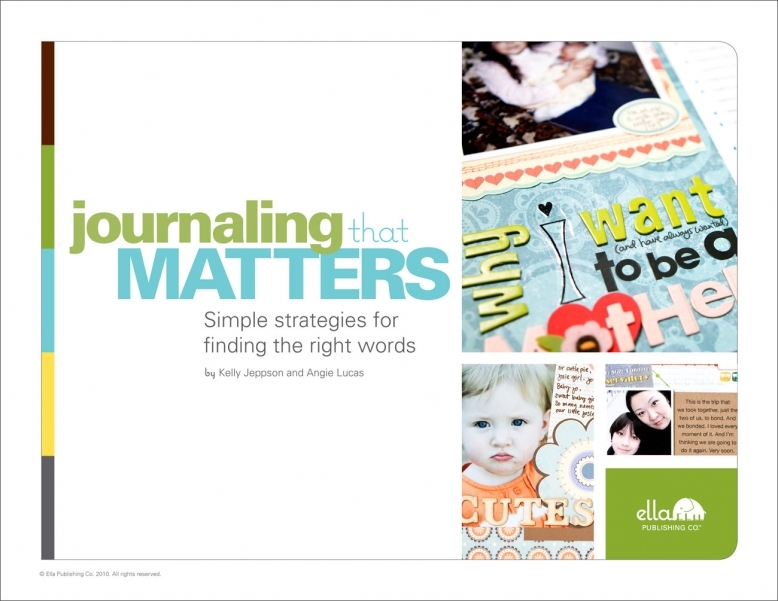 Kelly Jeppson and Angie Lucas are the co-authors of this Ella Publishing Co. edition and called on a number of very talented contributors to help them highlight the journaling ideas they share throughout this book. In addition to samples by the authors, you'll also find artwork by Linda Barber, Donna Jannuzzi, Moon Ko, Layle Koncar, Audrey Neal, Keshet Shenkar, Wendy Smedley, and Staphanie Wheeler. Simple Starters includes ideas such as transcribing a complete conversation and telling a story using numbers. Lists that Matter includes ideas such as using a list to document a time period and making a list of defining characteristics. 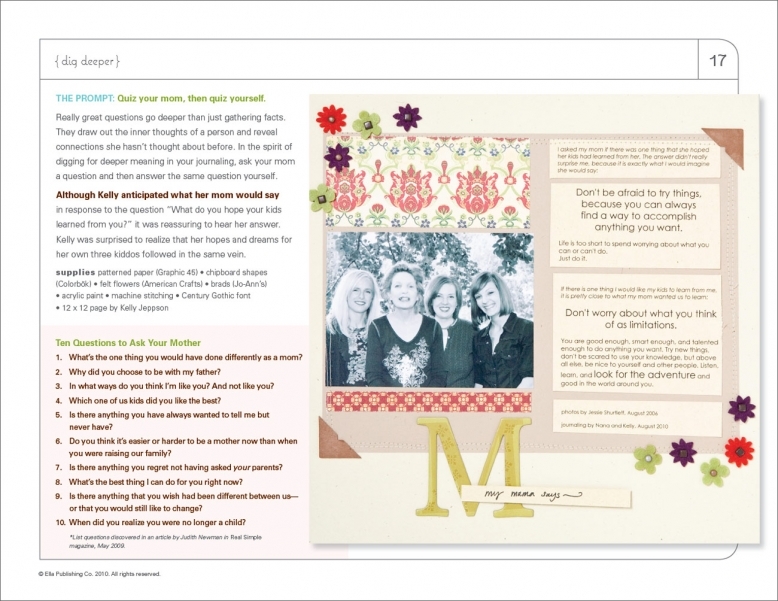 Dig Deeper includes ideas such as exploring an adjective and dispensing personal advice. Play with Format includes ideas such as saying it in a single sentence and saying thank you to an inanimate object. Of course, the authors go into explanation and further detail with each idea presented and includes a sample layout to drive the concept home. There are also numerous variations presented throughout the book, so the authors give you ways to stretch the prompts that they have provided to the max. Also included are bonus tips from the designers about products, design and techniques. 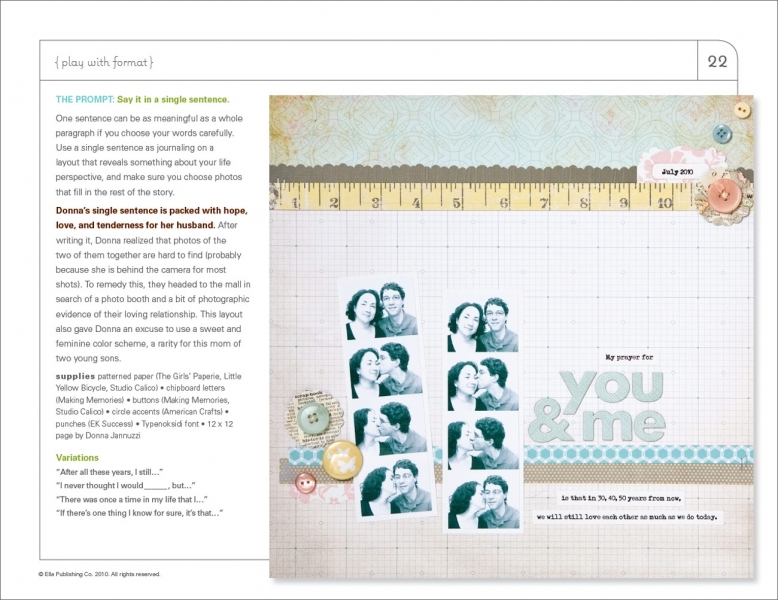 All in all, there are 21 beautiful layouts included in this 26 page eBook featuring a variety of scrapbooking styles as well as a mixture of both single and multi-photo designs. 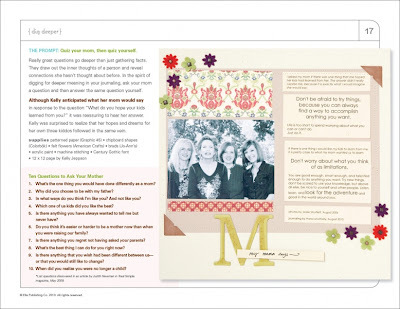 If you struggle with putting words on the page or simply want some fun and fresh ways to put a new spin on your journaling, Journaling That Matters might be just what you are looking for! I have one free download to give away to one lucky reader. All you need to do is answer the following question by 5 p.m. on Thursday, November 11, 2010. 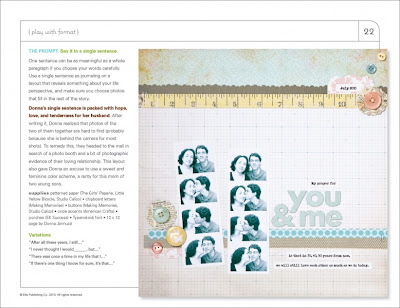 On a scale of 1 to 5 (with 1 being the easiest), how easy to you find it to add words (journaling) your layouts and why?